This entry was posted in rss on November 11, 2007 by Hussain Fakhruddin. 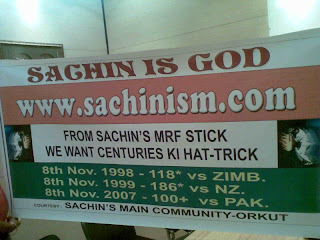 I am pleased to announce the launch of www.SACHINISM.com – My latest site on God of Cricket Sachin Tendulkar. If Cricket is one’s religion then Sachin is the GOD and the religion he spreads : Sachinism. I was lucky to have got this domain. The response was awesome. The was live countdown being followed by fans and over 100 registration in the first 3 hours! The site is in continuous development with new features getting added each day. Thanks to all the guys(specially Ved and Bhel) who have made this site come true. The site was developed completely from scratch using simple php scripts with modular design. There is a good security which I have implemented: HTML syntax checking, SQL injection attacks etc. Currently we’re developing an admin panel to give it a good backend for moderation. I am also planning to launch an E-Magazine for Sachin which will be completely like the normal magazines that we get but in the form of a PDF which can be distributed on the internet free of cost. Lots more to come… Stay connected! This entry was posted in sports on November 8, 2007 by Hussain Fakhruddin.